The primary cause of heart disease can now be understood, but authorities are not describing it. 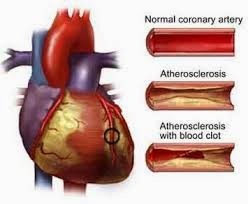 It is known that the way arterial plaques form is by leukocytes (white blood The primary cause of heart disease can now be understood, but authorities are not describing it.cells) attaching to the arteries and then filling up with lipids and calcium. Researchers don't say why leukocytes attach to arteries. There is logic and evidence that indicates chlorinated water is the cause. Chlorine kills bacteria by reacting with all types of biological molecules. Halides tend to react by substitution. That means they attach to the molecules they react with, and they migrate at low levels. Laws require residual effects with chlorine, meaning it still kills bacteria when it comes out the tap. When it is drank, it is going to react with molecules in the body. Among the first to be contacted are walls of the arteries. Chlorine attached to artery walls would create the appearance of a foreign substance. Halides (like chlorine) are extremely antigenic. So they would cause the leukocytes to attack the arteries. Then the leukocytes would do what they normally do, which is absorb free lipids and calcium from the blood. Calcium and lipids in the blood are supposed to be combined with carrier molecules; and if not, they are removed from the blood by white blood cells. Probably, a low percent of all calcium and lipids which enter the blood are not properly attached to carriers.